The field proven TacticalPower® UPS line is ideally suited for military, industrial, rapid response, medical, computer and telecommunications applications requiring high reliability, rugged construction, compact size and light weight design. These units are equally suited for use in shipboard, airborne, vehicular, field deployed or fixed locations with controlled or uncontrolled environments. The ETI0001-2227 is specifically designed for lightweight global power by the US Navy as the power source for critical systems because of the stringent performance and reliability requirements. 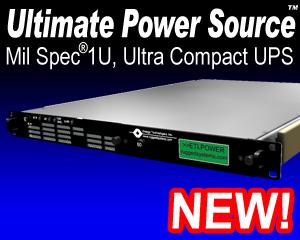 The heavy-duty chassis, occupying only 5.25”(3U) of rack space while delivering up to 1000 VA of clean, uninterruptible power. The rounded metal corners and rugged handles front and rear, aid in safe handling. Internally, all major components are well secured and electrically insulated to prevent damage due to shock and vibration. These units can be mounted horizontally or vertically. Optional heavy-duty rack slides provide easy installation and removal of the unit with full extension. The internal shielded input transformer provides galvanic isolation with provisions for both domestic (115 VAC, CONUS) and international (230 VAC, OCONUS) input voltages. The autoranging input voltage selection allows inputting either 115 VAC or 230 VAC without having to open the UPS enclosure. Special EMI/RFI filters and input power factor correction minimize both input current and harmonics. The unit also operates as a frequency converter, taking 46-70 hertz input and converting it to clean, uninterruptible 60 hertz power. Optionally, 46-440 hertz input as well either 50 or 400 hertz outputs are available. The LED arrays keep the operator informed as to the unit's status including load and battery levels. The Elapsed Time Indicator records the number of operational hours for records and scheduling preventative maintenance of attached equipment. The front panel also provides easy access to both the AC Input and Battery Input fuses. Coupled with the adjacent spare fuses, MTTR is reduced to less than 15 minutes. The internal intelligent thermal sensors provide two stage monitoring of unit temperatures, with both local and remote Battleshort override capability of thermal shutdown. Battleshort can be engaged via the front panel control, via a remote contact input or via a software command. When in Battleshort, an audible alarm is sounded and an indicator is lit. The high intensity audible alarm can be heard in high noise environments and includes an audible enable/disable switch. All controls and protective devices are brought to the front and rear panels with critical switches or circuit breakers having finger guards. Further, all front panel devices are recessed to prevent damage or accidental operation. Clips on the front panel hold spare fuses for ready access. The input circuit breaker and the galvanic isolation transformer all provide a double pole isolated source for shipboard systems or overseas locations where phase references and grounding are not consistent. The manual bypass feature included is operated from the front panel. Even in the bypass mode, the ETI0001-2227 still provides galvanic isolation, transient surge protection and EMI/RFI filtering. The ETI0001-2227 has the added benefit of having a field replaceable battery via front drawout battery module. The battery is a true hot-swappable module and does not require going to bypass like competing units. Even with this battery module removed, this UPS can continue to operate as an electronic power conditioner and frequency converter, providing clean, well regulated, sinusoidal power to the load. The batteries are maintenance free with immobilized electrolyte and are constructed of flame retardant materials for added safety. For more information, see the Battery Technology section. The rear panel provides locking connectors for the input and output power with various optional configurations available. This unit draws air through the front air filter and exhausts out the rear vent into the rack. This allows the unit to be used in negative or neutral pressure racks. For positive pressure racks, rear to front or rear to side versions are available. A removable and washable intake air filter and high capacity stainless steel ball bearing fan provide added protection in both controlled and hostile environments.